Urine contains many dissolved substances (solutes) that the body needs to eliminate as waste chemicals. These solutes can form crystals when the concentration of dissolved substances has increased or when the pH level is increasing in either acid or base. 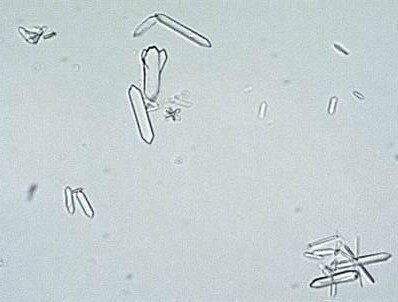 This condition of presence of crystals in the urine is known as crystalluria. Sometimes crystals are found in healthy people and other times they are indicators of organ dysfunction, the presence of urinary tract stones of a like composition (known as urolithiasis), or an infection in the urinary tract. 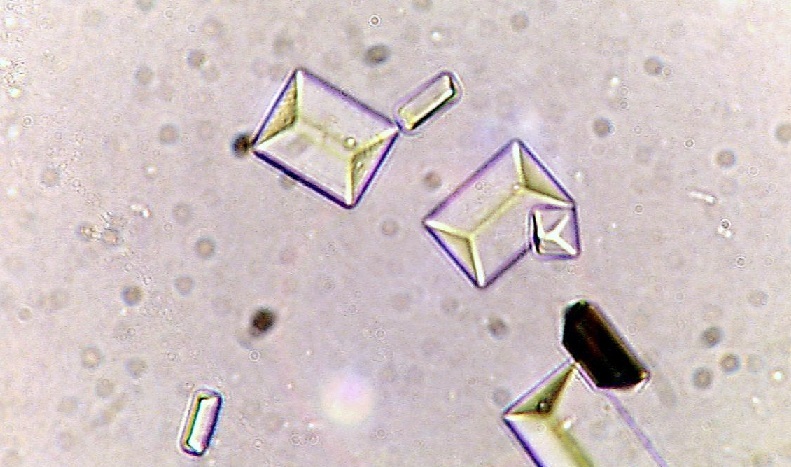 Uric acid crystals are of varying sizes and shapes, found in acidic urine. They resemble rhomboids, parallelograms, and rosettes in shape and are amber in color. 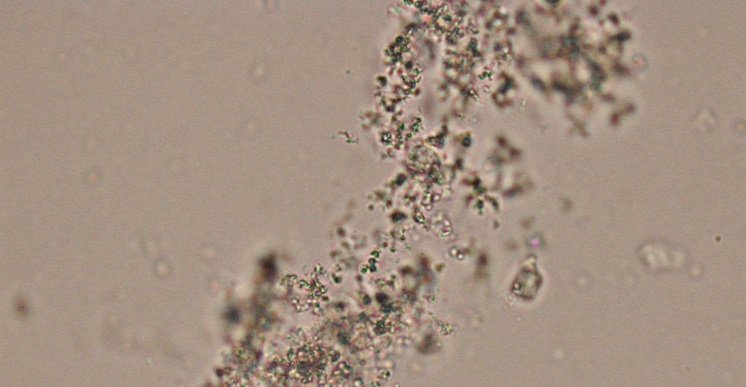 Though they are seen in normal urine, are also an indicator of disease processes, such as acute uric acid nephropathy or urate nephrolithiasis. 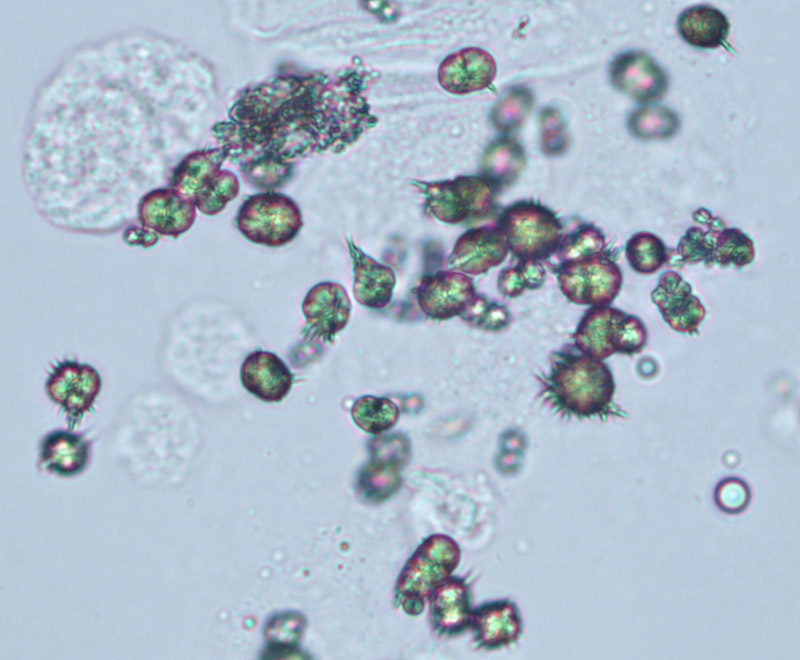 Calcium oxalate crystals are found in individuals with acidic, neutral or alkaline urine. 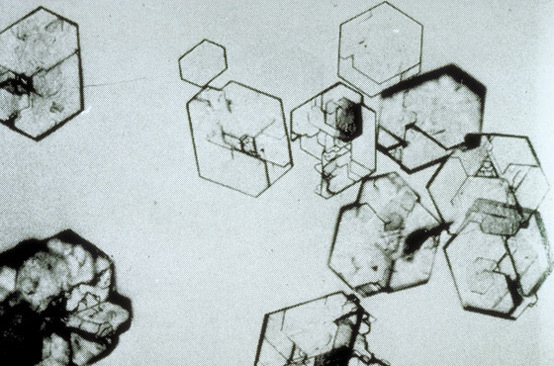 These crystals are colorless when viewed microscopically. There are two forms of the calcium oxalate crystal: the monohydrate and dihydrate form. 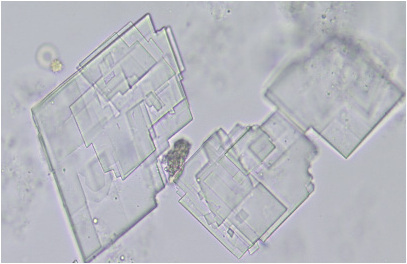 The monohydrate calcium oxalate crystal is described as the “picket fence” form. These dumbbells shaped crystals are common in ethylene glycol toxicity. The dihydrate form is octahedral or “envelope” shaped. Hippuric acid crystals are found in acid, neutral, or slightly alkaline urine. These colorless crystals are prisms, plates, or needle-like in shape. These crystals are often conglomerated into masses. Triple phosphate crystals form in alkaline urine and are composed of magnesium, ammonium and phosphate. These are rectangular in shape or similar with the coffin lid. These are sometimes associated with a bacterial urinary tract infection caused by urea splitting bacteria. Calcium carbonate crystals are yellow to colorless dumbells or spheres with radial striations, found in alkaline urine. They are usually large crystals and can be readily observed at low magnification. These are colorless crystals having shape like blunt ended needles or prisms, rosettes. These crystals are found in neutral to alkaline pH. 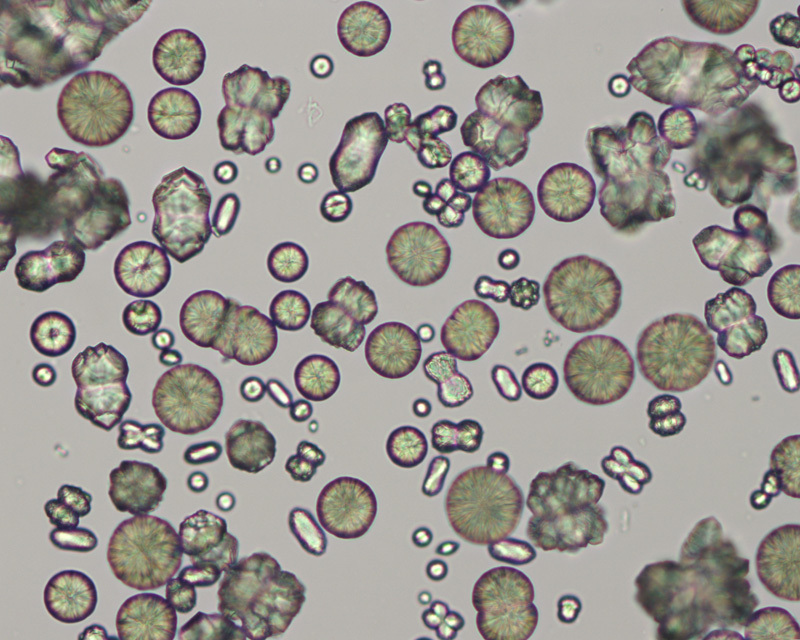 Ammonium urate (or biurate) crystals generally appear as brown or yellow-brown spherical bodies with irregular protrusions resembling “throny-apples”. These are found in alkaline urine. 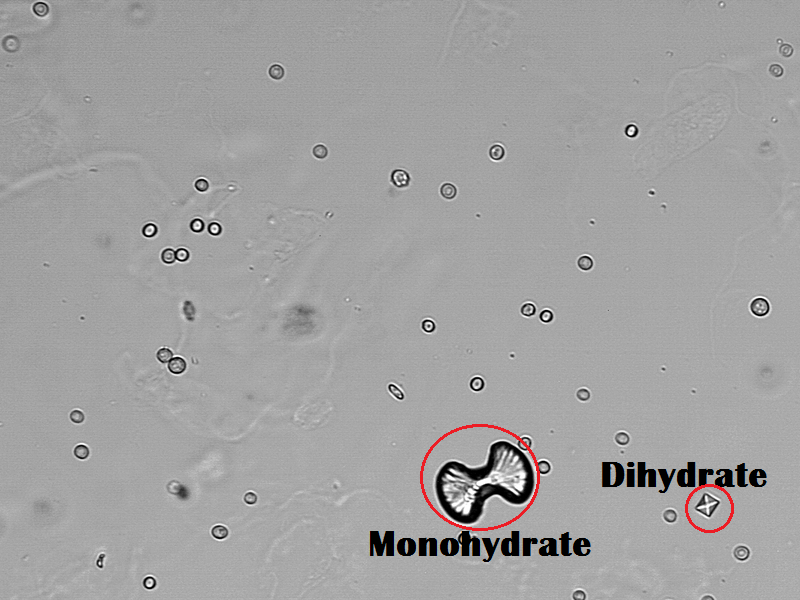 Amorphous urates are found in acid urine. 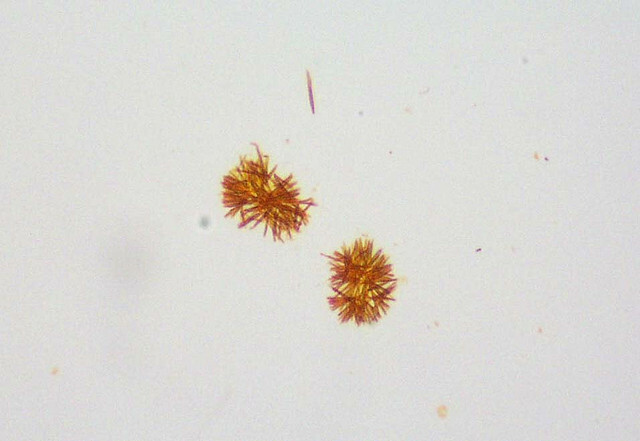 These crystals may appear pink on gross analysis and yellow microscopically. 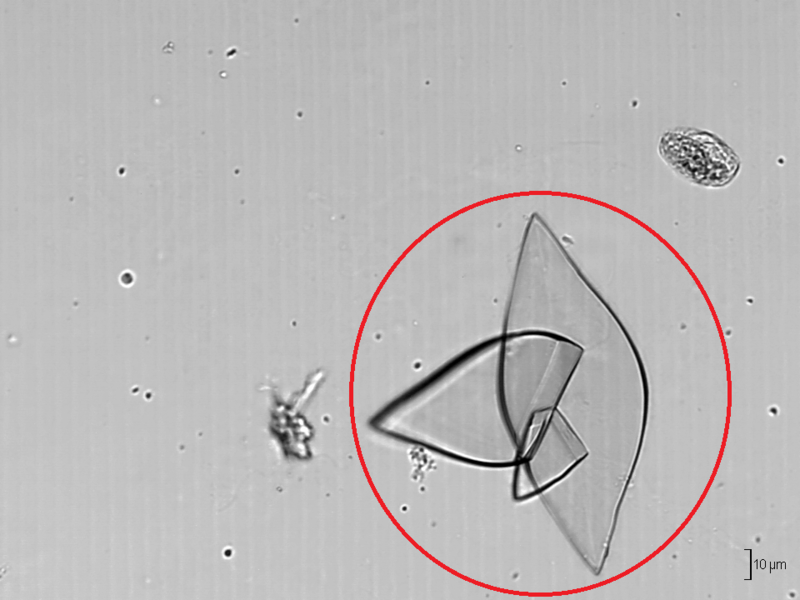 These crystals appear as granules in the urine sediment. Amorphous phosphates are found in alkaline urine. These granules are colorless microscopically. Bilirubin crystals are abnormal crystals in urine. 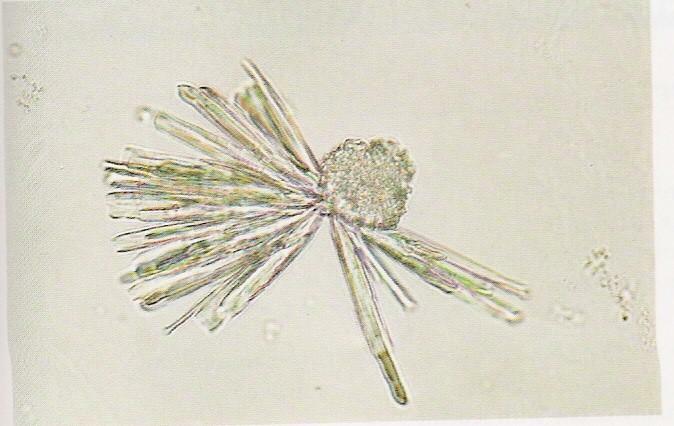 They form from conjugated bilirubin and are needle-like to granular crystals that are yellow in color. They are frequently attached to the surface of cells. Bilirubin crystals are seen in several hepatic disorders. These appear as colorless rectangular plates with a notch in one or more corners and are found in acidic urine. The appearance of cholesterol is associated with the Nephrotic Syndrome. Cystine crystals are flat colorless plates and have a characteristic hexagonal shape with equal or unequal sides. They occur in acidic urine that are associated with an inherited disorder. 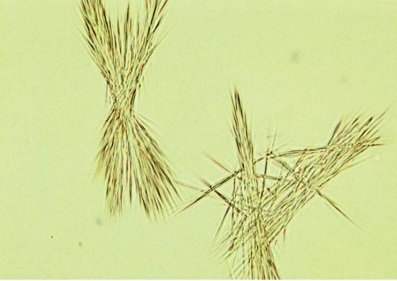 Presence of cystine crystals represents a proximal tubular defect in amino acid reabsorption. 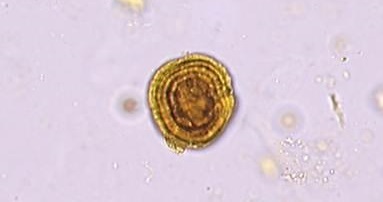 These are Yellowish-brown spheres with concentric circles with radial striations found in acidic/neutral urine. Leucine crystals may be seen in liver disorders in which amino acid metabolism is impaired. 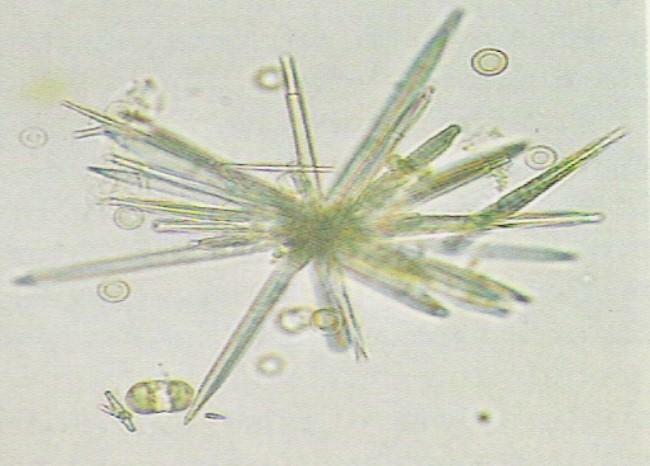 Tyrosine crystals appear as colorless/yellow fine needles in acidic/neutral urine. Tyrosine crystals may be seen in tyrosinemia and in certain liver disorders in which amino acid metabolism is impaired. These are flat needles, sheaves of small needles or as spheroids. Often brown in color. The presence of sulfanomide crystals usually indicates administration of the drug and not necessarily a pathological condition. However, their presence is also associated with kidney stone formation. Thank u so much DHURBA..this helped me a lot. Thank you Dhurba!! I am studying for the DHA exam for laboratory technician and i found this website so helpful!!! Thanks a lot!!! Thanks! Dhurba. it’s nice, short and precise valuable information. why some crystals is not belong a disease? Thank u for this post…it’s an organized presentation with prominent pics. Very good write-up,Dhruv.Hoping to read a lot more on this pages.Kudos!!?? so many their studies and work!